How To Do 3D Nail Art With Precision? 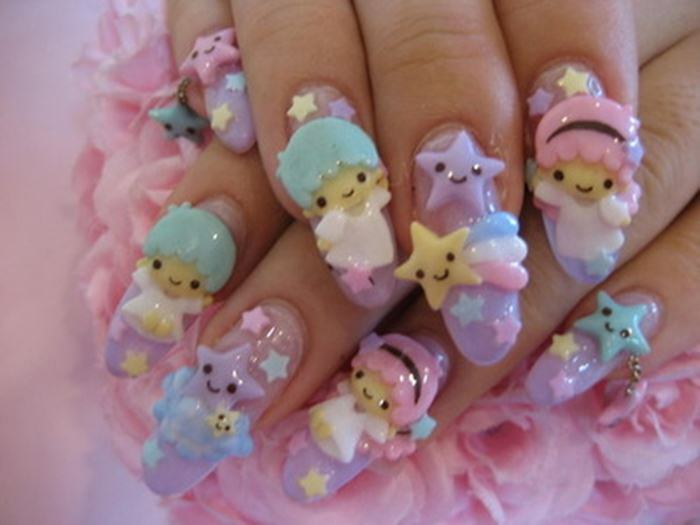 1 Where to get 3D Nail supplies? 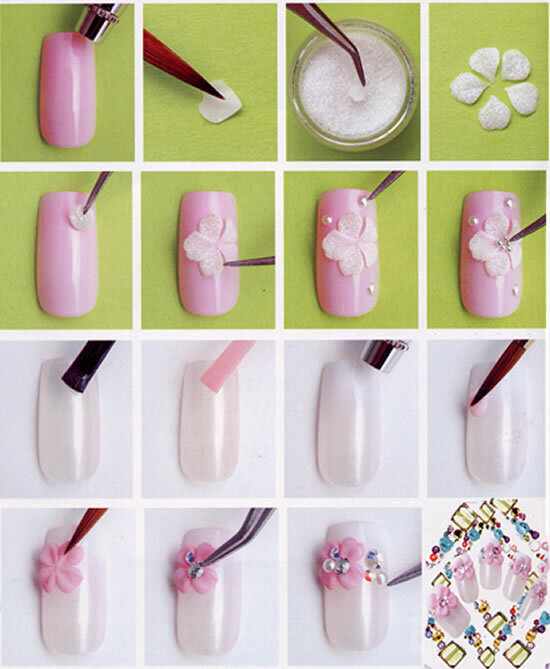 3 How To Do 3D Nail Art step by step? How To Do 3D Nail Art Step by Step? You can learn it from here but the actual outcome depends on your interest into nail art. 3D nail art or 3 dimensional nail art is a technique that is creating beautiful eye catching designs on nails, which are 3 dimensional in shape. 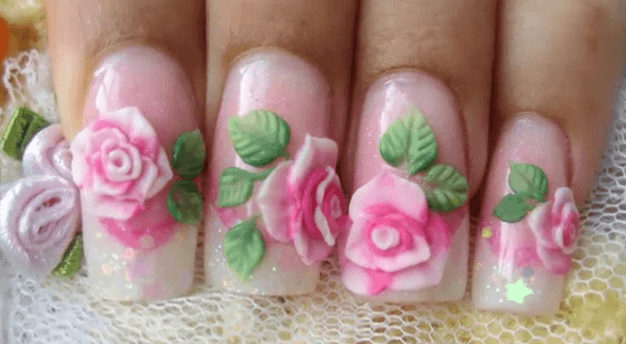 Some people also call it as Japanese style 3 D nail art, which goes off in artistically sticking Rhine stones, beads, pearls, hello kitty, plastic flowers to plastic vegetables. 3D nail art is done occasionally or regular days. 3D nail art is more preferred for special functions and bridal look. During regular days, utmost care is to be taken to maintain 3D nails. Where to get 3D Nail supplies? You can get 3D nail art kit from 3D Nail supplies online or from local market. You can create the best design of your own by selecting the some cute pieces yourself and giving your imagination wings. You can search for Nail art supplies online by typing nail art decorations, 3D nail art deco or 3d nail acrylic. This searches will provide you with good supplies for nail art. 3D nail art can be divided in few sections. 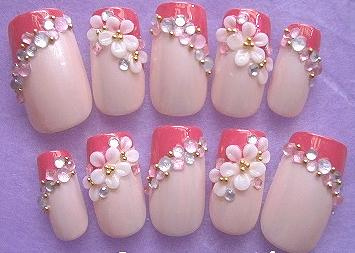 The one which is done with Rhinestones, dried flowers, decorations of 3D nail art. Second one is creating a 3D nail art with polymer powder and monomer liquid which requires great artistry. You have to master the art with 3D nail art brush. Here you can also create 3D shapes on acrylic sheets or plastic, once they dry out, pop it up and stick it with nail art glue. It is the best practice for 3D acrylic powder nail art till the time you master the art. 3D Nail art is basically done on acrylic nail sheets and then stuck on nails or vice-verse. We are not doing acrylic nail art here, but direct on nails 3D nail art step by step. Advantage of using acrylic nail base is, you can tear it out, if anything is not perfect. For doing 3D nail art on nails without acrylic, you have to be very careful. What you will require for 3D nail art tutorial. How To Do 3D Nail Art step by step? For simple Rhinestone 3D nail art, all you have to do is apply your base coat. Let it dry for a while. Caution: Never be in too much of hurry to stick Rhinestones. It can create a messy look. Dip the tooth pick in water and place it near the Rhinestones. Rhinestone will automatically stick to wet toothpick edge because of static force. At this point, you can either stick the Rhinestone with glue or with another coat of same nail polish. Caution: Nail art glue is basically an adhesive glue. It may tend to stick your skin so be alert while using glue. In case, if you mess up then don’t create more mess. Rather let it dry and wash your hands repeatedly, so that it will chip off. Press the Rhinestone slightly with the edge of toothpick for perfect placement. Apply a final coat of transparent base on Rhinestone and nail polish to give it a uniform shiny look. This is the easy nail art tutorial using toothpick. This tutorial is going to be how to do 3d acrylic nail art? It is difficult to give an explanation of nail designs 3D acrylic nail art so attaching video for it. Before going for 3D nail art, you can have a look at detailed French Manicure tutorial to create an ultimate finished look. 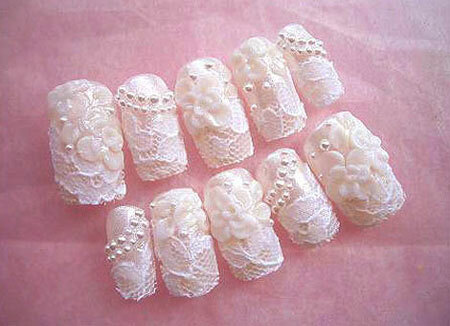 If you find this 3D nail art too exhaustive then you can also get ready made molds. Before that go through these 3D acrylic nail art videos or download 3D nail art video to watch it precisely. 3D nail art butterflies and ceramic flowers are also available easily. Purchase an online nail art kit and have precision in sticking 3D nail art decorations. Watch the Video De Nail art. Such nail designs Video can show you how to do 3D nail art perfectly? Caution: Don’t use cheap nail polishes. Your hard work will get wiped off or chipped off with cheap nail polish. Maintenance of 3D nail art is very much dependent on top coat. 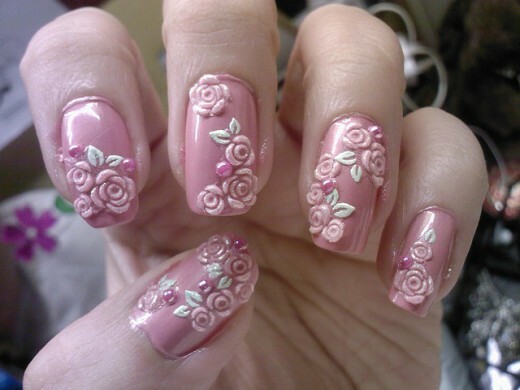 Apply a thick layer of top coat, so that big flowers and accessories remain stay put. Still you have to be careful to work with your nails. Visiting salon for 3D nail art is very costly affair. It gives you real professional nail designs3D nail art look, but proves to be very heavy on pocket. You can search online for 3D nail art salon professionals with your city name and inquire about the rates for different 3D nail art designs. Somewhere 3D nail art is also known as Japanese nail art. By now, we have inspired you enough to master, How To Do 3D Nail Art ? 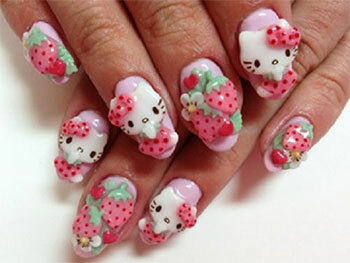 Attaching few pics for creating reference of 3D nail art designs gallery. Hope you have found the best designs to experiment from this 3D nail art designs gallery. Keep practicing and mastering the art of nail designs.